The deets: J.Crew skirt (old but this one is similar); J.Crew Factory top; Kelsi Dagger heels; Purple Paparazzi white bracelet (c/o); David Yurman necklace; Tiffany silver bracelet. Also - Don't forget to enter the bubble necklace giveaway here! I love it! I love when there is some color in the office! Oh my gosh I want that skirt!!!!!!!!!!!!! fab! I love the pink with the polka dots! Love the top...I've been eyeing a similar one from J. Crew factory. It's the collared one w/ pleated sleeves, but I believe they are the same material. How's the quality of this one? Does it get wrinkly and cheap-looking easily? I'm crossing my fingers for a good review from you so that I have an excuse to buy it! That skirt is divine, you look so classy! So cute! 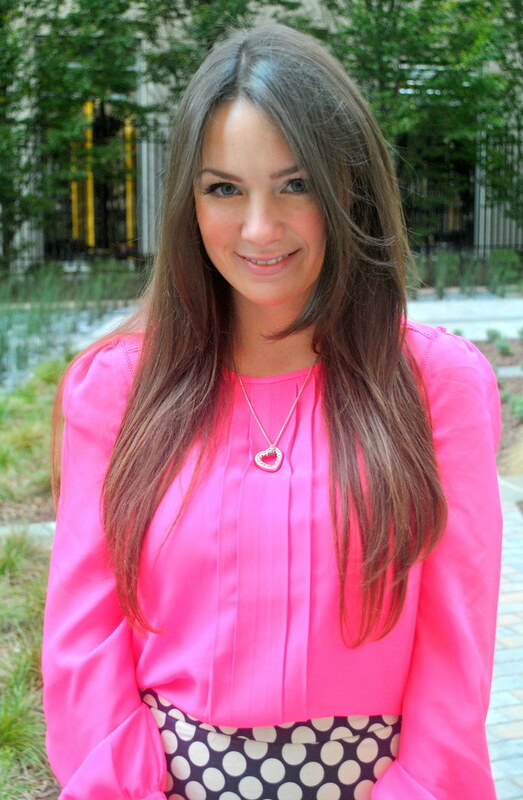 I love this bright pink blouse. And that skirt is adorable. absolutely LOVEEE this outfit!!! love love love it! 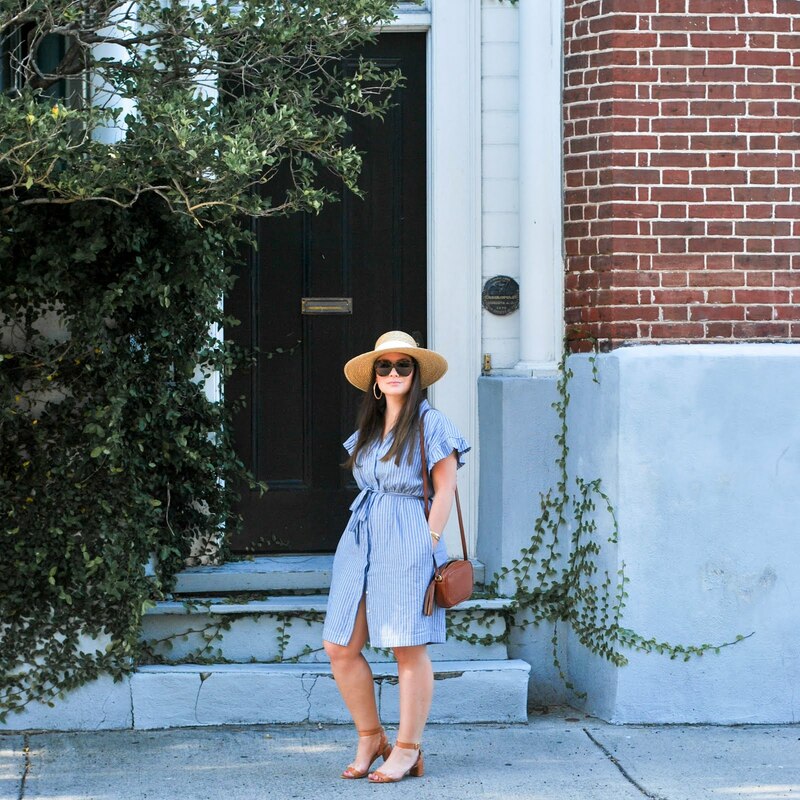 LOVE this ensemble! I think it is just perfect for work or anything else you wanted to do while wearing it! Beautiful blouse and I am REALLY into anything polka dot lately. This skirt is lovely! BTW... I just posted my outfit for today. Some might consider a red leather skirt a little "risky" for the office. Drop by and let me know what you think? 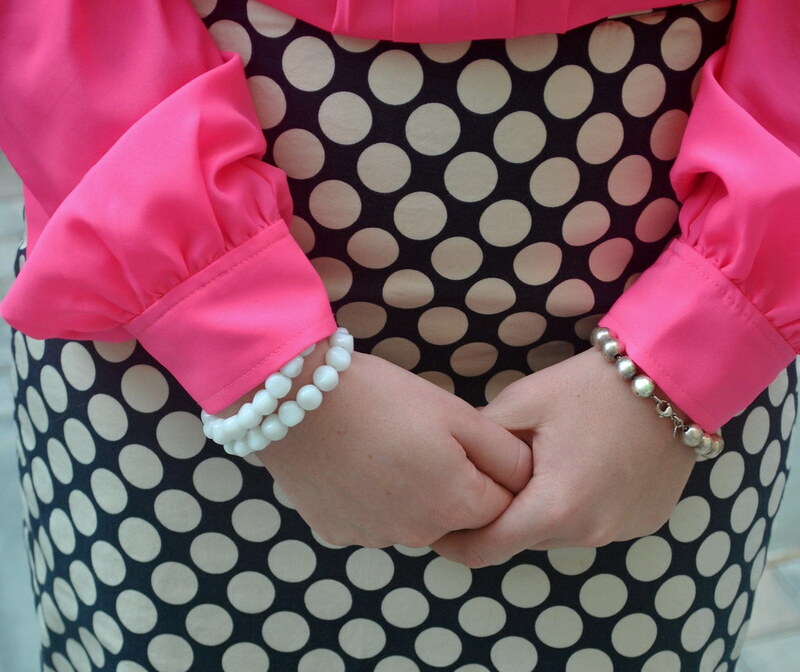 One can never go wrong with polka dots, and pink! You look flawless. Ha ha, cute post and adorable outfit! 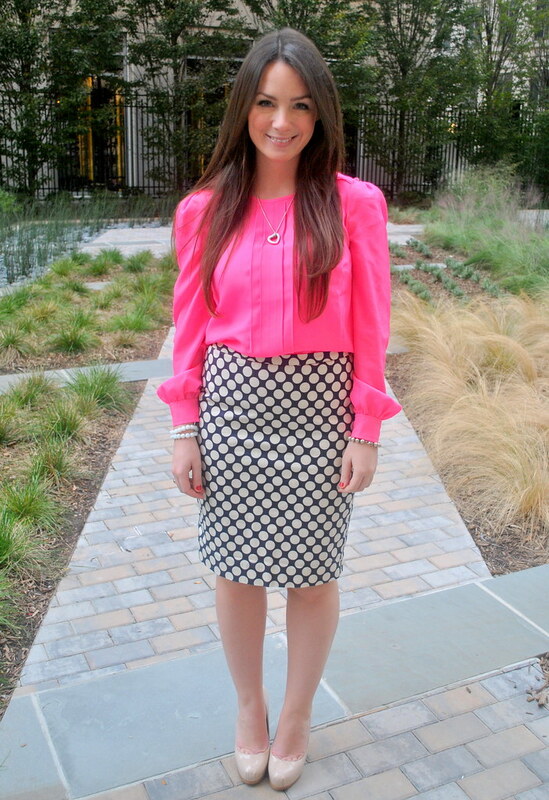 I just love that bright pink on you, and that polka dotted skirt is so fabulous and versatile! LOVE the pattern with the pink! You look fantastic! Such a great combo Erin. You look fabulous. Ha-ha that's funny! I would not say office clown, i like the brightest person at your team meeting. :) this is so cute. Wow love that top! The shoulders give it such a great shape and the color is lovely on you! You look SO cute, Erin! Polka dots + bright pink = perfect!! Lovee this look. 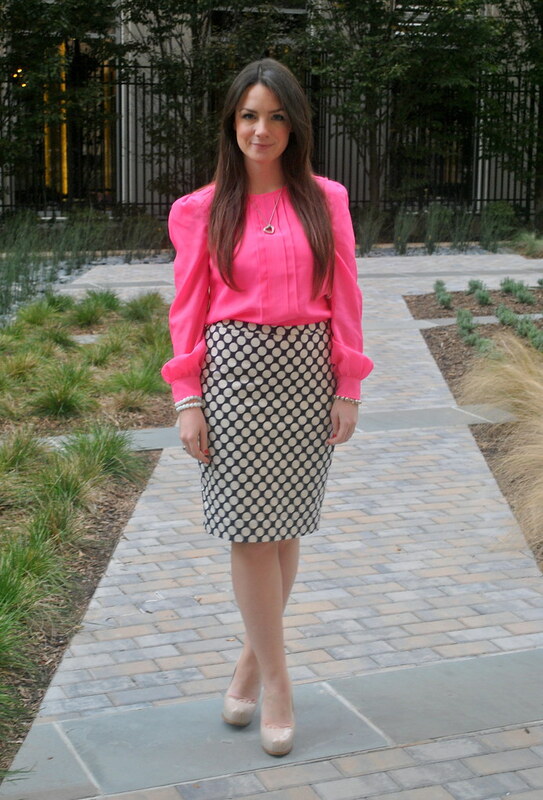 What a gorgeous outfit - that pink blouse is perfect on you, and with the polka dots! You look so cute! That J.Crew factory top has such fun details at the front and on the shoulders. This is so adorable!! Hot pink and polka dots what a wonderful combination! You pulled it off beautifully I might add!